All courses, including the Help sessions covered in the Timetable below are for Members only and require confirmation from the Tutor - Help sessions only, are exempt this confirmation. Not a Member - see the Join Now page. The timetables are updated on a regular basis and the search box makes your class dates and time easy to find. SeniorNet is a community learning network that supports and motivates mature people to enjoy and use technology in their everyday lives, join in the fun and learn how to do everything from understanding how to use your computer, working with basic documents, searching the internet, working with photographs, researching your ancestry, maintaining your computer plus much more. All courses are held in our Learning Centre, 12 Ben Lomond Crescent, Pakuranga. They are run in 2 hour sessions and some will consist of just the one 2 hour session while others will have several sessions and usually have a maximum of 8 students. In small, friendly and stress-free classes, you will gain the skills and confidence you need to get the most out of Information Technology. When considering and choosing courses it is important to think about what interests you and what you hope to achieve. Help is available from our experienced team if you are unsure how to proceed. To participate in the courses you must be a member of SeniorNet Pakuranga at an annual fee of $30 per member. An additional fee of $5.00 per course day is then payable for each course. Course materials are included in the cost either in booklet form, or electronic format. All members are asked to wear their membership badge to all functions as a courtesy to others. 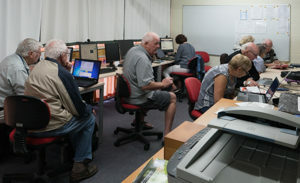 At our learning centre, retired volunteers from all walks of life provide a wide range of courses across a range of computer platforms, so there will be a course available to you which will assist you in obtaining full benefit from your device. We also provide Help days 3 or 4 times each month for our members having computer problems or queries. Confirmed bookings are required to attend courses. email or telephone the tutor. Help Sessions - no bookings are required. All columns can be sorted - click on the heading and use the search box. Below - course details - content and booking information. Fees help cover overheads and course notes. Click on the headings below to expand into the range of courses that interest you. All Course bookings require confirmation by your tutor. Confirmation is NOT required to attend Help Sessions. This course should be taken by all beginners, even if you used a computer in a work environment. This is Step 1 in getting to know and use a computer, with confidence. Know your way around a computer; point and click with a mouse; find, open and close programs and much more. How some settings are changed to suit your requirements. Look at anti-virus and anti-malware requirements (including explanation of some of the words used in ‘Computer Speak’). This workshop explores the features of your Laptop We check and discuss the uses of all those connections on the edges. See what's inside and research the system information like the hard drive GB and how much memory you have in GB. All this is also useful if you are intending to buy a Laptop to get some tips you can use when talking to the sales person. Come along and learn how to save your videos and files to a CD or DVD using a free download of Ashampoo software. Ashampoo also enables music CD “ripping” from you CD collection and format conversion to MP3 for that type of music player. If you have downloaded MP3 type files Ashampoo enables the creation of music CD’s both from MP3 and ripped CD’s sources. This course also covers the use Flash Drives as storage devices. Getting started using the award-winning software, RootsMagic. This course focuses on getting you set up so that you can start to record your family history for your family and future generations. If you have a laptop computer with Wi-Fi capability, please bring it with you. Don't worry if you haven't got one, we will lend you a memory stick so you can transfer your genealogy information to your home computer at the end of the course. This course focuses on using the resources available today on the internet and some of the other resource available in our local community. You will be provided with many sources you can use to explore family history beyond your present knowledge. You will find this workshop is useful for expanding your research toolbox. Again, bring your laptop with you if you wish. This Popup explores Google Docs and Google Drive. Docs is an easy to use application in which we write, insert and edit documents online. Your documents and articles are saved automatically. Find out how to share and collaborate with others. Learn how My Drive allows us to upload and download files to and from your computer and saves to folders which you create. Drive can also convert file types such as .doc, .docx and PDF. Here we explore Google’s Gmail, Google Contacts and Google Drive. Gmail makes email easy. With 2000 megabytes of free storage, you never need to throw messages away. Unclutter your Inbox using labels. Search for what you want. You'll not only find the message you have in mind, but all the other messages that are part of the same conversation. Save your contact profiles and download attachments or save to Google Drive. An introduction to Windows 10. Learn about the new features in this new operating system. You will learn to arrange your new desktop, moving the Icons and adding / removing Icons on the desktop. Arrange / rearrange the new Start menu, look at privacy settings to limit your exposure to reporting and advertising. Also included is Windows file Management System and how to navigate, create folders and move these folders. This course explores Microsoft Office Word application, a word processing application to type text and illustrate documents such as letters , articles. You will be shown how to add text boxes, columns, tables, shapes, pictures, using Auto Text, Clip Art and Word Art, headers and footers. Learn how to send and receive email with Microsoft Office (365) and Outlook. Save your contacts details and keep a calendar for your upcoming events. Email is a great way to keep in contact with friends and family, send and receive photos and files. Windows Mail is a Free application included with Windows 10 with many Outlook features included. This course shows you how to use the tools built in to Windows 10. Organise and browse your photos, enhance your photos and create a slide show. A full set of notes will be available. Transferring images from the camera to the computer. Editing, adding text, emailing and making a slide show, Backup and Printing. Bring your Android Smartphone and tablets to this workshop. The course covers a vast range of devices from many manufacturers that use versions of the Android operating system. We have prepared notes for you and these are more extensive than can be covered in the 2 hours. Bring your Android Smartphone and tablets to this workshop. The course covers more Advanced features for a range of devices from many manufacturers that use versions of the Android operating system. We have prepared notes for you and these are more extensive than can be covered in the 2 hours. Bring your own iPad or iPhone and learn what it can do. Find out how to do what you want at your speed. The iPad and iPhone is a capable tool for those who are in a hurry or looking for some downtime. Use the amazing camera, play your music, read books, use the diary, email - the list goes on and on. Be sure to bring your iPad or iPhone along to this class. An introduction to Windows 10 operating system with your own Surface tablet. Explore the tablet’s advanced features. Facebook - The social networking website for posting comments, sharing photographs, links to news or other content on the internet, chat live, watch short-form video. This Popup will cover what today's technology is capable of, from what a Smart TV is, the basics of where you start, what you need, how to use it, what you can watch, what apps to use to some of the hardware you can connect to the TV. connect a Laptop, Chromecast or Apple to your existing TV. This Popup will include some of those things that we all know, but need reminding about along with some of those that we do not know and wonder why we never thought of them. Copying Text and changing Fonts and Font sizes, open a Second/Third Instance of an application and snap it to the window. Adjust the Start Menu, The Hidden Start Menu, Create Borders and Dividers, The Curse of the Missing Ribbon, Install New Fonts, Fixing the mess made when you insert a picture and much more.